LG OLED65G6V 4K OLED TV review | What Hi-Fi? Which is the best TV? That is something we are often asked. It is also something we never answer in haste for there are many factors to consider, including price, size, form factor and features of varying desirability. But occasionally a product comes along that tempts us to forget reason and start drooling like a dog at a butcher’s window. Take the LG OLED65G6V 4K OLED, for example. It’s a stunning specimen of technology and design. It is so fancy that LG’s marketing department had to launch it with superlative superlatives, such as ‘ultra-premium’. It even qualifies for membership in LG’s ‘Signature’ squad, which is a bit like the Avengers of high-tech home appliances. What’s so special about it? For starters, the LG G6’s picture is easily one of the best we have seen. Its OLED panel yields absolute blacks with precision lighting and no halo effects whatsoever. The 4K Ultra HD resolution (3840 x 2160) guarantees a pixel-dense and sharply-defined picture. Then there’s high dynamic range (HDR) for greater contrast and a wider colour gamut. The G6 features a 10-bit panel and 10-bit processing and over 90 per cent of the DCI-P3 colour gamut, which means more than a billion colours. It reaches 800 nits peak brightness and less than 0.0005 nits black level (where one nit is roughly equivalent to the light from a single candle). Ultra HD and HDR, served on an OLED platter – this is the holy trinity of television technology. Don’t just take our word for it. The G6 ticks all the boxes required for an Ultra HD Premium badge, an industry standard set by the UHD Alliance – a confederation of manufacturers and film studios. The G6 is also compatible with Dolby Vision, in case that currently niche brand of HDR ever takes off. We wouldn’t go so far as to call the G6 ‘future-proof’, but we’ve rarely seen a TV this well equipped to deal with current and approaching trends. For the nostalgic, there is also passive 3D, with two pairs of glassed included. We bombard the G6 with several test discs, including The Martian on Ultra HD Blu-ray. There is no better test of dynamism than the abyssal blacks and blinding lights of the final frontier, but the G6 flies through the assault course set by rough landscapes, sunlight glinting off helmets and bright outdoor scenes that transition to deep space with twinkling stars. It’s not the amount of fine detail that impresses us (though there is plenty of that), nor the depth of darkness it achieves – it’s the dynamism offered, and the level of nuance with it. Bright things shine and dark things are obscured, and never are the two compromised. Even in the tricky scenes where NASA folks stare at flashing screens in the dark, there is plenty of discernible detail. Colours are subtly shaded too, with all the minute variations you would expect in real life. In the scene where Matt Damon successfully grows his first potato, the shades of green on the leaf are entirely natural and convincing. One of the issues of past OLEDs was noticeable vignetting (the picture being darker at the edges), especially on the curved sets, but this appears to have been addressed. 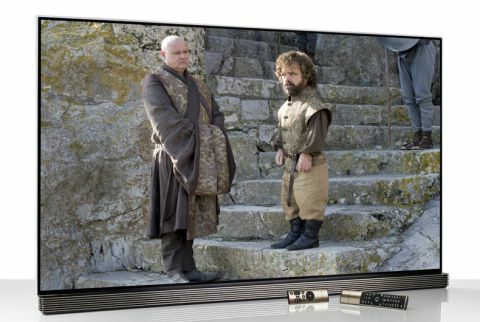 Don’t worry if you don’t have UHD Blu-ray – they are not a requirement to enjoy this TV. The G6 also makes the most of 4K streams on Netflix and Amazon Instant Video. Watch the non-HDR shows and you might notice a drop in colour depth and overall impact, but it’s never short of vibrant. Move down to Blu-ray and DVD and it’s still good. The G6 is an adept upscaler. While you lose fine detail the further down you go in resolution, the picture is solidly defined and there is minimal picture noise. Motion struggles a little but that is easily sorted by the TruMotion settings. The default is a bit strong, with noticeable artefacts, so we’d recommend manually pushing ‘dejudder’ and ‘deblur’ to no more than the second or third notch. All in all, this is about as good a picture as we’ve seen this year. LG has clearly made an effort, and the G6 sounds good, as it should do with a 60W, 4.2-channel speaker base developed by Harman Kardon. Though LG recognises it is no match for a dedicated speaker set-up, it has pledged to keep on top of midrange clarity and direction of sound, which fires forward at the viewer rather than up or down (as is common in many TVs). Besides having some proper speakers, LG has added a clever audio calibration mode, which uses test tones to tune the TV’s sound to your room. It works, as we found the tuned sound to be more tonally balanced than the default. Elsewhere, the G6’s sound is large and spacious, with ample bass weight and greater dynamism than we’d expect from something so thin. It’s more subtle and rounded than the LG OLED65E6V (the model beneath the G6), which uses a 40W, 2.2-channel soundbar stand. The G6’s sound would be improved with some proper speakers, or a dedicated soundbar like the Dali Kubik One (£798.99) but if you want an all-in-one set-up, it’s good enough to handle movies by itself. For fans of wall-mounting, here’s the clever bit: the speaker base folds and tucks under the TV, with sound coming out of a secondary grille. This means that, whether you stand the TV up or stick it on the wall, the sound will always fire forwards. We take a step back for a moment and admire the television as a whole. On a purely aesthetic level, the LG G6 is a beautiful thing. For starters, it is the thinnest TV LG has produced. The OLED panel itself measures 2.57mm, with a sheer panel of glass fixed to its back for reinforcement. LG has gone for a ‘unibody’ approach, where everything slots neatly into place with no obvious point of dismemberment, so you’ll struggle to find any ugly screw holes or bolts. You’ll also note that the G6 has a flat screen, LG heeding the cry of the customers who don’t want curved screens, particularly in the high-end market where TVs are best served wall-mounted. The G6’s stand is more than a mere plinth too, housing connections including 4x HDMI, 3x USB, ethernet, aerial, digital optical out and component via a bundled adaptor, which avoids bulking up the screen. The intuative Web OS interface is now in its third iteration, and LG hasn’t messed around too much with its successful formula, basically a pop-up bar of brightly coloured cards that let you jump between apps and inputs. It’s smooth, fast and intuitive, and it’s no surprise some rivals have followed suit. There’s new stuff in the form of ‘My Channels’ and ‘My Content’ cards. As the names suggest, they offer shortcuts to your favourite channels and content. There you can pin specific TV series to the pop-up bar, which saves you the step of going into an app. Speaking of apps, you get most of the important ones, namely Netflix, Amazon Instant Video, NOW TV and BBC iPlayer, plus Demand 5 and Google Play Movies. At the time of review, there was no sign of ITV Player and All 4 - fingers crossed those will turn up eventually. Finally, there are two remote controls. The main remote is a refined version of last year’s model, which successfully blended a scrolling, gyroscopic pointer with the traditional buttons-on-a-stick formula. The second is a smaller, more restricted offering, which is ideal if you want to keep things simple. We love the LG OLED65G6V. It has everything we want: a stunning picture, gorgeous design, great sound, and one eye on the horizon. But we can only give it four stars because of the price tag. Though picture quality is on the same level as the LG OLED55E6V, that TV costs £1000 less. True, the G6 has the advantage of a better-sounding speaker base, but we don’t feel that justifies the price hike. We would rather have the E6 and spend the remaining cash on a soundbar or speaker system, with change to spend on a couple of UHD Blu-rays. The LG OLED65G6V is a statement product designed to show off what the company is capable of, and that it certainly does because in most ways this is as good as it gets.